My wife for her birthday wanted to go to New Orleans for a long weekend. As I was pricing things up, she said we could drive there, and I replied no, not when we can take MegaBus for $6.00 each round trip! I was already on the Megabus website when she suggested driving to me. While booking the tickets, I noticed that I could reserve seats on the bus for a tiny fee. So, I decided to reserve two seats on the lower level at a table. As it turned out, this was the way to go. Two round trip tickets at $6 each, plus the reserved seat fee at $2 each and the booking fee of $1.50, the total came to $17.50 for the round trip. I can’t buy gas one way in my wife’s Toyota Prius for that price let alone paying for parking when we got there. Since Megabus picks up downtown Atlanta, I decided to use Uber from our house to the city bus stop. Our bus for New Orleans was scheduled to leave at 6 am. So I decided to it would be best to request an Uber ride at 4:45 am. Uber was not available until just after 5 am, but this was still not a problem. Uber from our house to the downtown MegaBus stop cost us $27.64. Once downtown at the bus stop, we were told by a Megabus representative that our bus was running up to three hours late. This did not bother my wife and me as much as it did other people waiting on the bus. I also received an Email from Megabus customer service saying that our bus was running late. Once the bus arrived, passengers coming to Atlanta disembarked. The bus was quickly cleaned, and then we started to board. We pulled out of Atlanta exactly three hours late. 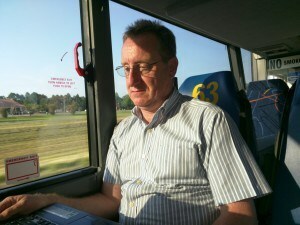 Colin on MegaBus at a Table Seat working. On the way to New Orleans, we made three stops. The First was at a Pilot Truck Stop just forty minutes after we left Atlanta. The driver asked all of us to get off the bus for safety reasons as he needed to refuel. At least the bus stopped at a large truck stop where we could use the bathroom and buy refreshments and snacks. We made two more very short stops along the way dropping off and picking up passengers; one in Montgomery Alabama and the other in Mobile Alabama. Once we got to New Orleans, the driver kept all of us on the bus until the luggage was unloaded. I suspect this was for safety reasons as one time we witnessed a bus driver getting injured offloading baggage to inpatient passengers. Once off the bus in New Orleans, we crossed the road and used my Uber app and hailed Uber to pick us up and take us to our hotel. Our Uber fare was: $9.37. A day after our outbound trip, I received an Email from MegaBus saying that they will refund our bus fare of $6.00 for our bus picking us up late in Atlanta. This was a surprise. Our bus back to Atlanta was on time. We, we arrived half an hour early and our bus was already at the stop taking passengers on board. This was a good thing since it was so hot outside and could get on the air conditioned bus immediately. Again, we had reserved seats at a table, and we used Uber from the hotel to the bus stop for $8.71. We made three stops on the way to Atlanta. The first stop at Mobile Alabama to pick up and drop off passengers, the second in Evergreen Alabama at a Love’s truck stop for half an hour; and the third at Montgomery Alabama again to pick up and drop off passengers. We arrived back in Atlanta on time. Again we had to wait on the bus until our luggage was unloaded then we were allowed to disembark. Once more I used my Uber app on my phone to hail Uber to pick us up. Uber arrived within ten minutes, and our fare back home was $27.27. The transportation cost for our trip from Atlanta to New Orleans was $90.49 for two people. This includes our MegaBus and Uber Fares. Travel time from door step to door step was 11.5 hours one way; averaging for the 3-hour outbound delay. If we had flown, we would have paid $269 each on Delta Airlines and $196 each on Southwest but would only be looking at 6 hours travel time each way including travel to the airport and the cost from the airport to downtown and back. If we had driven, it would have taken us 7 hours each way. Also, at $2:10 per gallon driving a Toyota Prius the fuel cost would have been $39.40 round trip plus the cost of parking in New Orleans at on the low end $20 per day. In the end, a trip for five days, Megabus was the cheaper way to go. You do have to a value on your time before deciding to use Megabus. All types of travel are prone to delays, and MegaBus is no exception. The thing that makes waiting for a late MegaBus is very often the wait is outside! While you’re waiting for the bus that’s running an hour to two hours late, think to yourself that you could be waiting for a flight for the same amount of time, but it cost you much more! Furthermore, when you’re stuck waiting for a delayed flight and feeling thirsty, you may end up paying more for a bottle of water at the airport than you did for the Megabus ticket. 2. Take a warm sweater with you on your Trip. Even when it’s super hot outside, heed to this one! Megabus run their buses cold inside, and the driver doesn’t have any control on the temperature! It’s always best to have a warm sweater when riding the bus, so you feel comfortable. 3. Take anti-bacteria wipes or hand sanitizer with you. MegaBus does have a toilet downstairs close to the back. At best it’s on par with the toilets at the back of coach on an airplane and at worst it’s nothing more than a smelly bucket! Because there is no running water on the bus, they provide hand sanitizer. But every time I’ve needed to use the toilet on the bus I found it to be empty. So my advice is to take anti-bacteria wipes or hand sanitizer just to be on the safe side. 4. Don’t rely on MegaBus’s internet. Even MegaBus admit they own the internet is useless! Or put another way; Pen writing a letter, stuffing it into an envelope, sticking a 2nd class stamp on it then mailing it, the letter will get there quicker than trying to send an Email through bus’s internet service! Okay, I exaggerate here. The point I’m making is think of MegaBus’s WiFi internet service as non-existent. Take your own WiFi (or MyFi) hotspot device or tether your cell phone to your laptop for reliable internet access. Table Seats on the lower level. 5. Spend a little extra and reserve a seat. 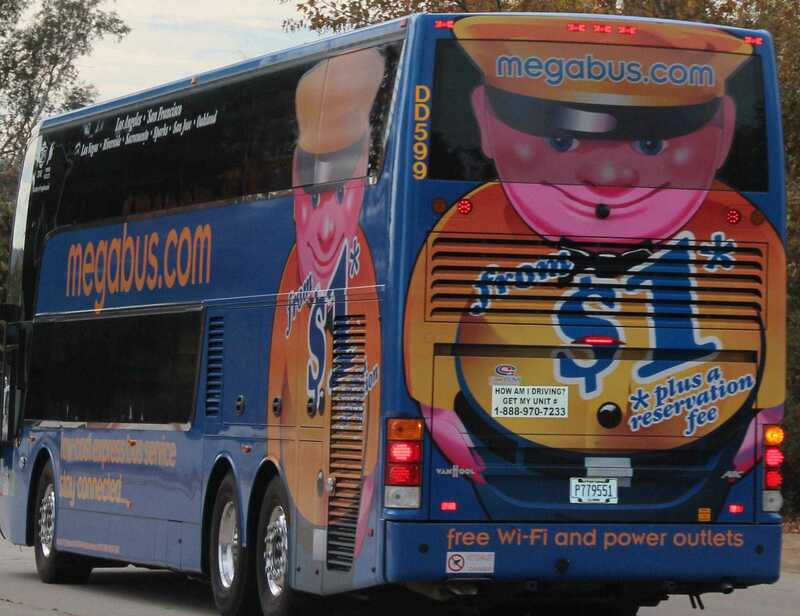 Here’s the funny thing with MegaBus. You can reserve a premium seat for as little as $1. Premium seats go quickly along with cheap fares and the closer to the trip before booking the most expensive the fair becomes and the harder it is to reserve a premium seat. Go figure, the further out you book, the cheaper the fare and the best chance of reserving a premium seat. If you plan on working on the bus, plan on getting a seat downstairs with a table. If you want extra legroom and a good view, reserve a seat on the upper deck at the front. If you can book and reserve a seat, do so! They’re well worth it. 6. If you are going to use your electronics, make sure they are charged. Every seat on the MegaBus has a power outlet for your electronics. Although these power outlets are more reliable than the buses WiFi, sometimes they don’t work. So better to be safe than sorry and make sure your electronics are well charged before taking the trip. 7. Take food and water with you. Unlike the airlines, there’s no flight attendant or bus attendant for that matter serving food and drinks during your Megabus trip. The bus can go as long as four hours without stopping. So take along something to eat and drink. You will thank me later for this one. 8. If you can, travel with a friend. Traveling on the MegaBus is safe and generally is not a problem. Tickets for the bus ride have to be purchased online using a major credit card at least 24 hours in advance. This prevents a lot of undesirables from using Megabus. The safety problem is at some of the stops. If I’m traveling on my own, I hail an Uber driver to meet me when getting off the bus. Better yet, have a friend meet me or I travel with a friend. Some of the stops are in not so good areas, especially after dark. 9. To get that fare, book in advance! Yes, it’s possible to get those $1 fares. To get them you do have to book in advance and be flexible with your travel dates. 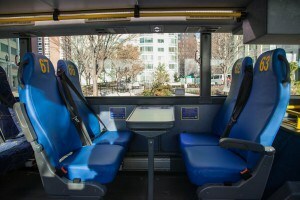 I estimate that out of 88 seats on the bus; only two are sold for $1, and the fares go up from there. The sooner you can book the better, but unlike the airlines and hotels, MegaBus only books out a maximum of 3 months in advance. 10. Take only one piece of luggage with a maximum weight 50 Lbs and only one small carry-on. 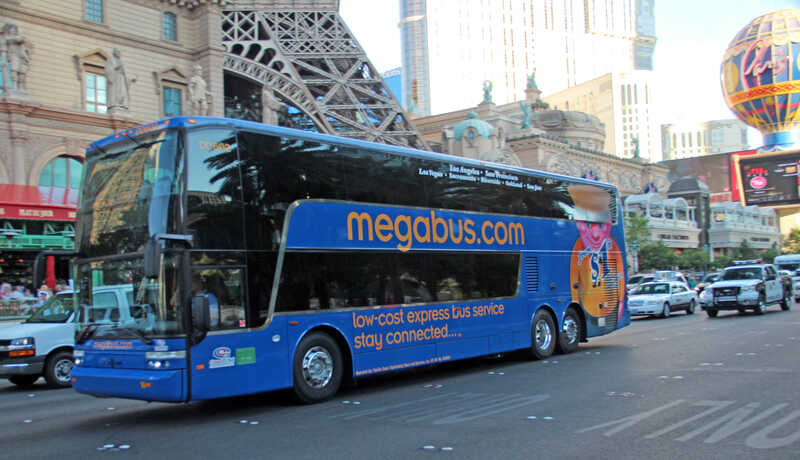 Remember, riding Megabus takes a little longer than driving to a destination but is far cheaper than flying or taking the train. It’s a margin call whether to drive or take MeagBus. I look at some things including productivity (can’t work on my computer while I’m driving) to the total costs of driving (gas and parking). I also have to think “do I need a vehicle at my destination?”. 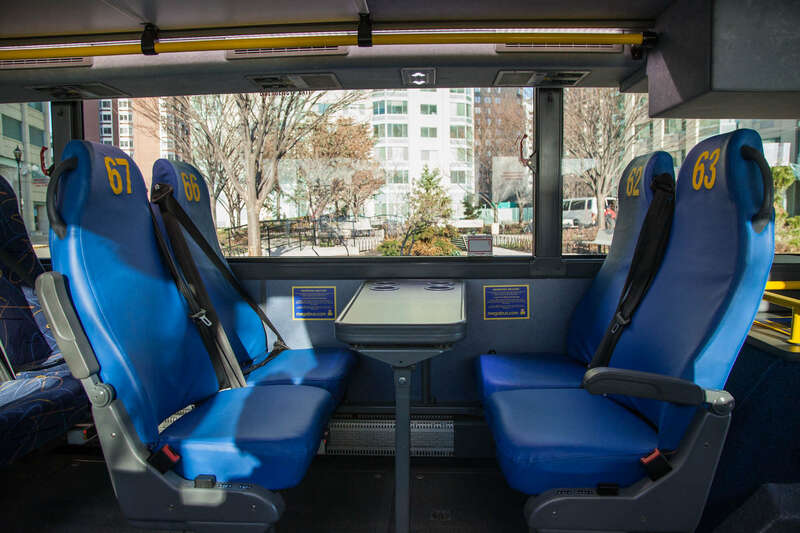 These and more considerations have to be thought about before taking MegaBus. On the stress level of things, taking MegaBus is the way to go! Your comment about the luggage allowance is not completely correct, at least not anymore. If you have more than one piece of luggage you’re allowed to bring it on the bus as long as you purchase an extra ticket. This way, you’ve kind of “reserved” an extra space for your luggage. Astrid, Thank you for the update. Colin Robinson.